I noticed an issue when moving a sprite on the screen on Android devices. The movement is not smooth, a bit choppy, barely noticeable, but it's there. Take for instance the Jumping Ball example that comes with the Gideros installation package. On iOS, it moves very smoothly, but on Android devices (I tried on two very fast Android devices) the movement is not smooth, the ball seems to stop for a millisecond from time to time and then move again. I tried with Gideros 2014.01, 2014.10 and 2015.02. Is anyone else experiencing this problem? Or is it a problem with my eyes that are too sensitive to movement? It depends on the Android device and the manufacturers version of Android. Also it depends on the garbage collection settings in your lua game - before a level starts make sure you do a garbage collection after setting it up. Of course it depends, I'm sure. However, I tried on (now 3) different Android devices (OnePlus One, Nokia XXL and Samsung Galaxy S5). 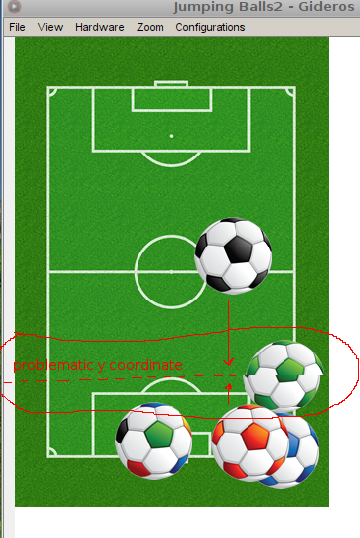 I am not talking about a complex game, but rather a very simple example, the Jumping Ball project from the Gideros examples folder. It behaves in a same "less smooth" manner on all devices. On my iPad and iPhone the same code runs very smoothly. Any idea why? did you set the fps of the game to 60 instead of 30? Yes, it was 60 by default in project properties, I haven't changed it. Now I tried to see how it is with 30 and is horrible indeed. But still, even with 60, I can see an extremely little "roughness" in ball's movement. no luck with this trick then. you can measure fps btw (there are simple code snippets on the forum i believe) to check if it is 60 as it should be. devices may lock the fps for less. I used the fps code and it shows 60 or 59 so it should be ok. This is very strange and I have no idea where else to look. Next thing would be the gideros android player to check more. @grotly have you tried loading other games from the play store written in Gideros to see if they also do the same thing? That example runs perfectly fluid in my S3. 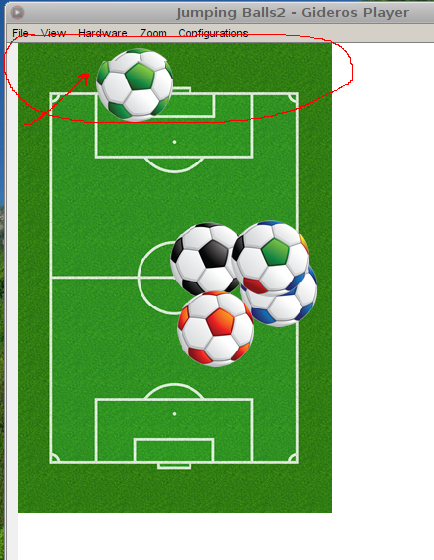 Even the one with 5 balls runs very very smooth using the Gideros player with and without scale mode. Can be an issue with newer devices? I have an S3, various tablets and a HTC M8 (android 5) - all run ok here. @grotly, I don't know if that's the case: I had a very strange slow down once, only on latest and powerful android devices. The FPS printout was consistent with older (and slower) devices, but the game was lagging a lot more. After struggling for a week I noticed that my Eclipse was missing some updates from the latest android sdk which - I'm guessing - maybe was used on those new devices. Updating Eclipse and recompiling the project solved my issue. @pie thanks, I'll give it a try. Ok, I think I found a way to show what the problem seems to be in Androids. I slightly modified the Jumping Balls2 sample project, just to amplify the issue, and it seems to show now what I meant. Just unzip the project and run it in Gideros Player, first on an Apple device (I tried on an iPad Mini 1st gen. but you can try on something else, just not a very old device). You will see that everything runs very smoothly. Now, run the same project in Gideros Player on the most powerful Android device you have around. See what the problem is? Of course, the effect is amplified on purpose, but this is visible for me with just a few sprites on the screen. In my game I have just about 20-30 sprites moving with that speed at the same time on the screen and it is very,very visible. The example project I have attached here has 500 sprites, but like I said, only to show the problem on Androids. On apples, even with a bit more sprites, it still runs very smoothly. Maybe could be worth adding it to the open issues on github? I have got the same issue. It seems a tiny problem but it is definitely a motivation killer. I had left to develop my game for this reason since a year. Then I had tried to determine this problem but my skills are limited. * The problematic y position changes for each start with different number sprites(mine ~200). I mean the sprite number differentiates the y coordinate position. * Sometimes the problem does not appear but grotly's example shows this problem clearly. I get it on the desktop players too - it's like the 60hz interrupt isn't synced with the screen properly. Very interesting. For some time now I have been wondering why my own graphics stutter when my FPS counter shows 59-60FPS at any given time. I figured it wasn't too important and I could resolve the issue later in development but this does seem to be quite an issue now. I got this on desktop's full screen mode. Then i tried to increase my VGA performance, and it's gone. I think that the sync for the screen in the gideros code (QT) must not be the sync for the actual phone/computer - it should be. If not then they will get out of sync but still show running at 60hz, being out of sync would result in this judder. It's really aproblem on win32 QT desktop export. It goes away if you restart the game. It's always happened with Gideros though, but it would be great if there was a fix.